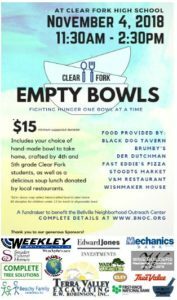 BELLVILLE — On Sunday, Nov. 4 , 2018, the Clear Fork Valley will have its firsts Empty Bowls event at Clear Fork High School to combat hunger in Bellville and Butler. As a community, Those in the Valley pride themselves on the support they provide for one another, and that is no different when it comes to ensuring everyone has t e nutritious food they need every day. 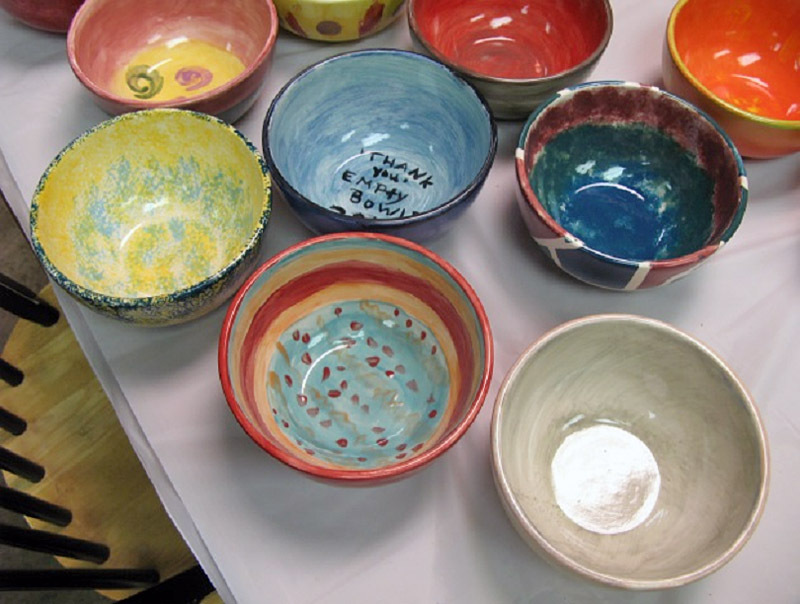 The concept behind Empty Bowls is simple: To come together as a community and rally around our own. At the event, guests will make a small contribution and receive a meal of delicious soup and bread, all donated by local restaurants. The best part is the meal is served in a beautifully hand-made bowl, crafted in art class by Bellville and Butler Elementary School 4th- and 5th-grade students. As a thank you, and as a subtle reminder of the local fight against hunger, participants donating at least $15 are welcome to take their one-of-a-kind bowl home … while supplies last. Although this is a new event to this area, Empty Bowls events have been held in communities across the country for years. While every community’s objectives remain the same, each event is self-developed and independent. These events would not be successful without the generous support of hundreds of community members and vital sponsors coming together for one worthy cause. 2018 Empty Bowls Sponsors include Terra Valley Excavating, Weekley Chrysler Jeep Dodge Ram, Beachy Family Chiropractic, Complete Tree Solutions, Edward Jones Investments, Mechanics Bank, Wise Construction, First Knox National Bank, Global Oilfield Services, Hursh Drug Bellville, Smith’s True Value, Snyder Funeral Homes, Wade Gardens, Elzy Milling and Trade, and US Bank Bellville. Event proceeds will go to the Bellville Neighborhood Outreach Center to aid its food pantry and food distribution efforts that assist hungry neighbors throughout Bellville and Butler. The BNOC is extremely grateful for the opportunity to partner with the Clear Fork art classes and local businesses who are joining together to support families across the Valley. Again the Empty Bowls event is Sunday, Nov. 4, from 11:30 a.m. to 2:30 p.m. in the Cafeteria at Clear Fork High School. Tickets are available at the door for suggested donations of $15 for adults (includes hand-made bowl) and $5 for children younger than 13 (includes disposable bowl). The meal will be simple meal is provided by local chefs, restaurants and businesses, including Black Dog Tavern, Brumby’s, Der Dutchman, Fast Eddie’s Pizza, Stoodts Marke , V&M Family Restaurant and Wishmaker House. Event proceeds will benefit the Bellville Neighborhood Outreach Center (BNOC), whose mission is to support and enrich the lives of Clear Fork Valley residents by developing and operating a community service center. The center includes a food pantry, a clothesline, and an activity center. The BNOC strives to provide those in need with some of life’s essential items including food and clothing. For more information about the 2018 Clear Fork Empty Bowls event, contact Terri Hamilton at 419-989-5344 , or email dtham272@embarqmail.com.